This Idaho state motto is Latin for "It is Perpetual". 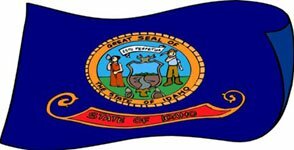 The Idaho motto was adopted in 1891 as an element of the state seal. The Idaho motto has its roots in a sentence made by Pietro Sarpi (1522-1623) a Venetian theologian and mathematician. His last words before he died were: "Esto perpetua", meaning: "Mayest thou (Venice) endure forever". Emma Edwards-Greene translated the Idaho state motto as "It is perpetuated" or "It is forever". "The Gem State" or "Gem of the Mountains"
This one of the Idaho state nicknames refers to the finding of rich veins of various metals found in the Idaho mountains such as: gold, silver, copper, cobalt, lead, zinc along with rare mineral gems such as star garnets, opal, jasper, jade, zircon, topaz and tourmaline. George M. Willing provided Idaho with this Idaho nickname when saying that Idaho was an Indian word for "Gem of the Mountains". 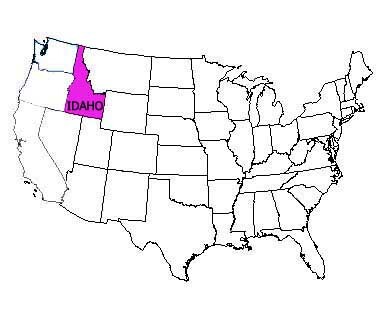 This Idaho state nickname probably arose because of Idaho's small size when compared to most other western American states. Some of these Idaho funny state slogans can be bought on t-shirts and stickers among other things. Or maybe Alabama, Alaska, Arizona, Arkansas, California, Colorado, Connecticut, Delaware, Florida, Georgia, Hawaii, Illinois, Indiana, Iowa, Kansas, Kentucky, Louisiana, Maine, Maryland, Massachusetts, Michigan, Minnesota, Mississippi, Missouri, Montana, Nebraska, Nevada, New Hampshire, New Jersey, New Mexico, New York, North Carolina, North Dakota, Ohio, Oklahoma, Oregon, Pennsylvania, Rhode Island, South Carolina, South Dakota, Tennessee, Texas, Utah, Vermont, Virginia, Washington, West Virginia, Wisconsin, and Wyoming.